When I was nine, dad took my brother and I out of school to attend a pre-heavyweight boxing championship sparring match featuring Muhammad Ali, one of the greatest, if not THE greatest, boxer in history. I don’t know if my mom knew we played hooky that day and since she does not read this blog, we’ll continue to keep it a secret. Although I don’t remember much about the sparring session itself, I knew that it was a privilege for me to have seen Muhammad Ali and whenever his name or the sport of boxing comes up, I think of dad and that day. As unusual as it sounds, boxing and perfumery have some things in common: Undina wore Serge Lutens Boxeuses (female boxers in French) to fortify her before meetings and won Round One (and I bet, all rounds thereafter). Lucas over at Chemist in the Bottle wrote a review of Atelier Cologne Santal Carmin, and described the bright red boxing gloves in the ad visual as a metaphor of fighting for his dreams. Coincidentally, I happen to enjoy these two perfumes and have full bottles in my collection! What does this have to do with Caron? For me, the classic quote by Muhammad Ali “Float like a butterfly, sting like a bee. The hands can’t hit what the eyes can’t see.” describes the textures of Caron, from the softness and barely there lightness of the down puff to the sharp spiciness of Bellodgia. My fascination with House of Caron started a little over a year ago. 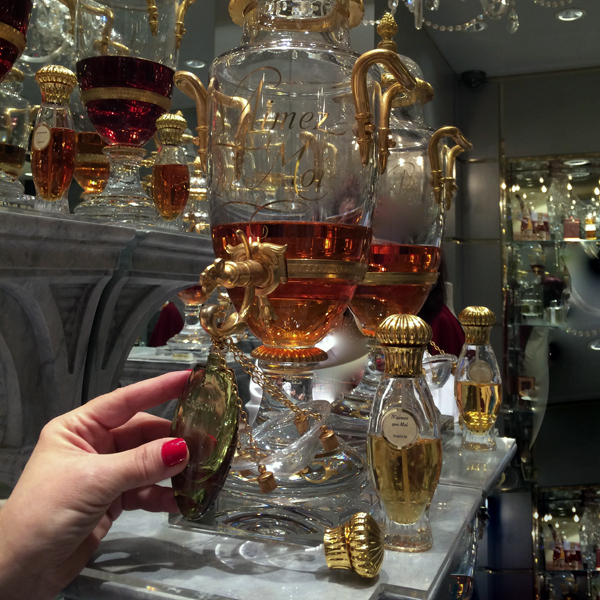 My visit to the Caron boutique in New York City was prompted by reviews of Caron perfumes by Steve, blogger extraordinaire of The Scented Hound. 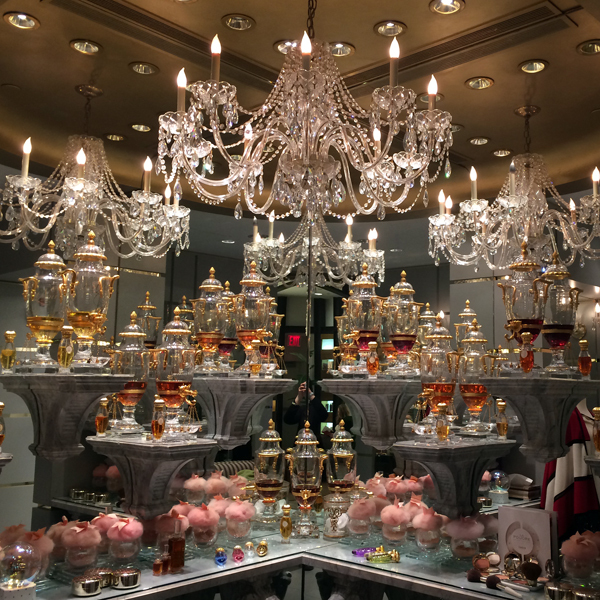 I have never explored the brand and its perfumes; I did not even know there was a Caron boutique, the only one outside of Paris, in my own backyard! And so it was with eager anticipation that I arranged to meet a perfumista friend at the Caron boutique (715 Lexington Avenue @ 58th St. New York, NY 10022; 212-308-0270). To my surprise, my friend was waiting outside the building and she told me that the boutique closed early because of a private event at the Phyto Universe Spa, where the boutique was co-located. Determined to get the Caron experience, I went back the next day and have been back several times since then. The boutique is on the 3rd floor of 715 Lexington, entrance on 58th Street (see an updated address in the end of the post). You will not see a Caron sign anywhere. 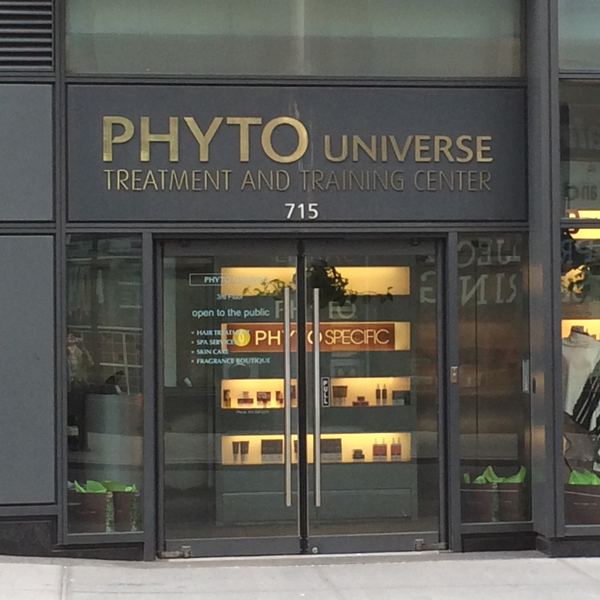 You know you are at the right place when you see Phyto Universe. Go through the street level double door entrance; let the receptionist know you are going to the Caron boutique and head straight to the elevator to the 3rd floor. The elevator doors open to a waiting area and – TA-DA – the boutique is on the right. If you can imagine angels heralding visually with crystals instead of blowing trumpets, it was exactly the feeling I got upon entering the boutique. The chandelier is perfectly centered between spotless right-angled mirrors and brightens the boudoir-like space. 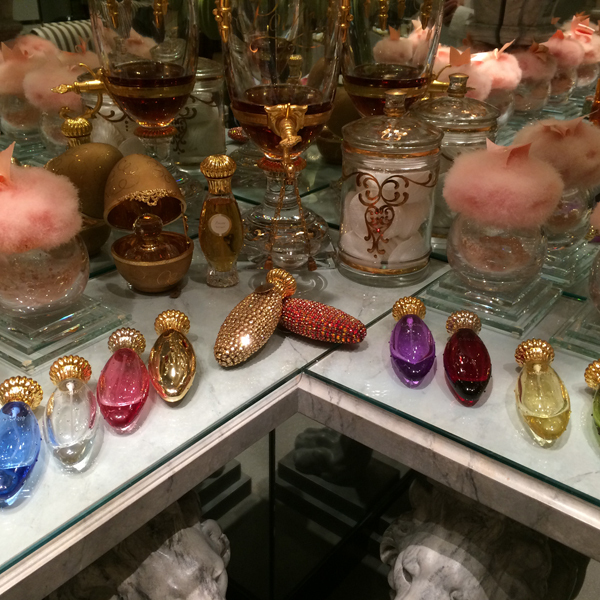 Six lion-head claw foot legs support a display counter filled with all sorts of accessories – Caron Picot travel sprays (colored glass, gold covered, Swarovski Crystal-studded in a myriad of colors), Limoges Egg perfume bottle holders, and weightless goose-down powder puffs. Along one wall are a series of curio cabinets filled with more of the travel sprays, unusual perfume bottles and a scale model of the Baccarat Crystal urn that you can own if you have about $4,000 to spare. There are two tables with tester bottles of the Caron perfumes. Of the fragrances that are not dispensed through the urns, my favorites are: Aimez-Moi, Parfum Sacre and Montaigne. Some of the perfumes come in unusual bottles, such as the one for Lady Caron that has a cutout of the head of the Statue of Liberty on the face of the bottle and a pointed cap to represent the crown. The Caron website has several more limited editions that are worth a look. 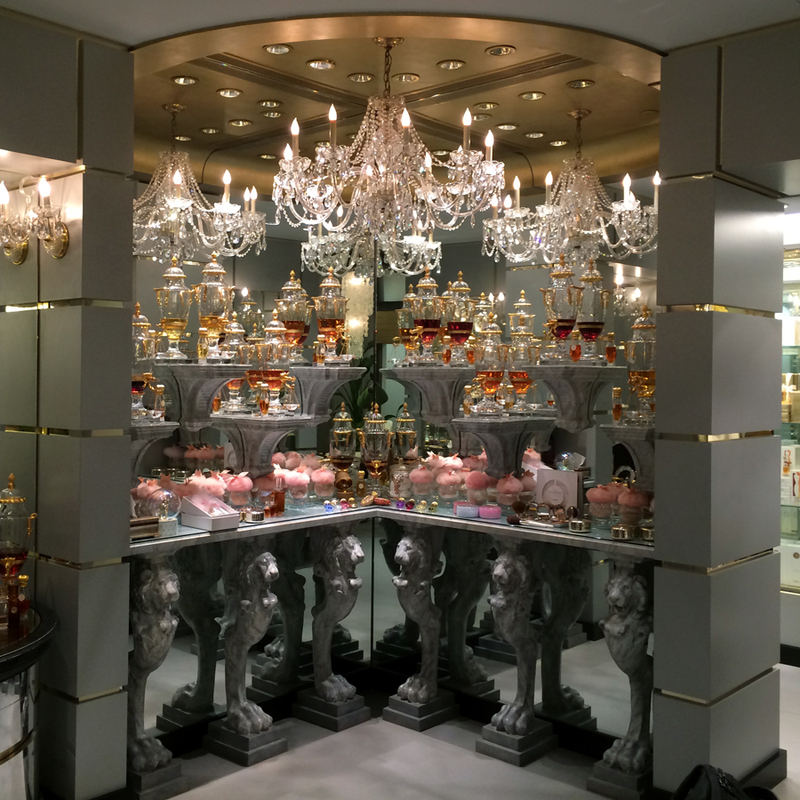 The iconic Baccarat crystal urns are presented on top of marble pedestals at various heights, and, together with their reflection on the mirrors, makes it look like there’s double the number of urns than in reality. Take a guess at how many urns are displayed! To satisfy my curiosity as to how the urns dispense perfume into a flacon, I decided to purchase a Caron Picot travel spray in my favorite green color. I chose N’aimez-que Moi for this experience. If you look at the gold band on the lower third of the urn, you’ll see a spigot and a swan’s head/neck. With the opening of the flacon directly beneath the center of the swan’s head, a turn of the spigot opens the tap, filling the container. Seeing my travel spray filled with haute couture perfume gave me a thrill. If I have an unlimited budget, I would probably want one of each of the urn perfumes but I want to be there when they’re filled to experience the thrill over and over again. The Caron boutique is a must-see when you’re in New York City. Caron perfumes are not widely distributed and you’ll be glad you visited. For an in-depth write-up on the House of Caron, see The House of Caron: Love, War and Perfume in Fragrantica written by Michelyn Camen. To continue her enabling ways, hajusuuri offers a giveaway. There will be two winners; each will get one of two sets. Set 1: samples of Caron perfumes; Set 2: a sample of vintage Caron Bellodgia extrait, a sample of Serge Lutens Boxeuses AND a 4 mL decant of Atelier Cologne Santal Carmin. This giveaway is open to everyone worldwide. The giveaway is open until 11:59PM PST on May 2, 2015. The winners will be chosen via random.org separately for each set and announced in the next statistics post. Please note that neither Undina nor hajusuuri is responsible for replacing the samples and decants if they were to get lost or damaged. To be entered answer the question below AND tell in what country you live. If you do not want to participate in the draws, there’s no need mentioning the country where you live but please answer the question below for Undina’s statistics post. How many perfumes do you think Caron has currently in production (in all lines)?